Open sandy or rocky ground, dunes, sandy open forests (jack pine, aspen), edges of coniferous forests, in fens; often thriving along grassy roadsides and in clearings. One of our finest wildflowers. 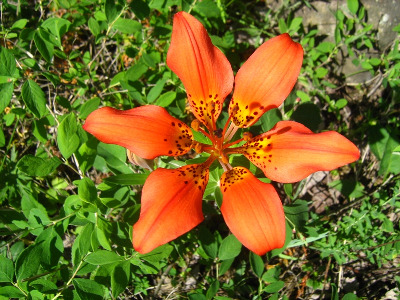 Plants may have as many as 5 flowers (very rarely -7), although fewer (often only 1) are usual. The flowers are normally orange to nearly red, but the yellow-flowered form [f. flaviflorum E. F. Williams] has been found very rarely in Michigan. A form with the tepals unspotted as well as yellow [f. immaculatum Raup] has been collected at West Bluff in Keweenaw Co.
MICHIGAN FLORA ONLINE. A. A. Reznicek, E. G. Voss, & B. S. Walters. February 2011. University of Michigan. Web. April 21, 2019. https://michiganflora.net/species.aspx?id=1629.